← An extended road trip or a satisfying life? As soon as I bring the bird feeder home, I want it on the window. Oh, this is going to be so great! I’ll be able to watch the birds up close! I press the feeder onto the back window of the Best Little Trailer. I get the bag of mixed bird seed and pour it in. Okay, all set. An entire day passes without one visitor. Oh well, that’s not surprising, what with it being stuck on our window. The next day while I’m putting dishes away, two purple finches fly to the feeder! I’m still glad I bought it. If Spike will keep his fat head away from it, I’m sure it’ll be a popular feeder and fun to watch. Speaking of Spike . . .
He’s still on the job! He has those heifers hoofing it out of here. I think these bovines are hostile. Look at the white one. That’s not a stare. That’s a GLARE. And I don’t like the angle of the ears. Do you realize, out of all the things you could be doing right now, you’re looking at heifer photos? Don’t get me wrong. I’m glad you’re reading my blog and everything, but really, HEIFER PHOTOS? Okay, moving right along . . .
Every day is beautiful here. I see this BLM post every time we return to camp. I don’t want to leave. You know how clean, fresh morning air has you thinking. . . gee, it’s great to be alive? That’s the kind of mornings we have here. I’m trying to find a camp as nice as this with the same perfect weather. It’s not easy. No more long walks on the sandy lanes. Although the presence of cattle and occasionally ATVs probably keeps the rattlesnakes away, I’m not going to chance it. A few days ago this skinny guy reminds me to be careful. I don’t know if he’s dead or torpid. I don’t hang around to find out. The “lawn” around our campsite (see first photo) allows me to have a pretty good view of the ground upon which I place my feet. This morning the air is so pure and the grass so green that I’m lured away from the campsite. I’m perfectly happy wandering around studying the plants that are leafing out after so many warm days. Tiny violet, five-petaled flowers no bigger than a bee’s wing are sprinkled about. Bridget and Spike watch me from our campsite. They are so sweet. I sense their concern from afar. I bet they’re gonna’ talk about me later in the Canine Corner! 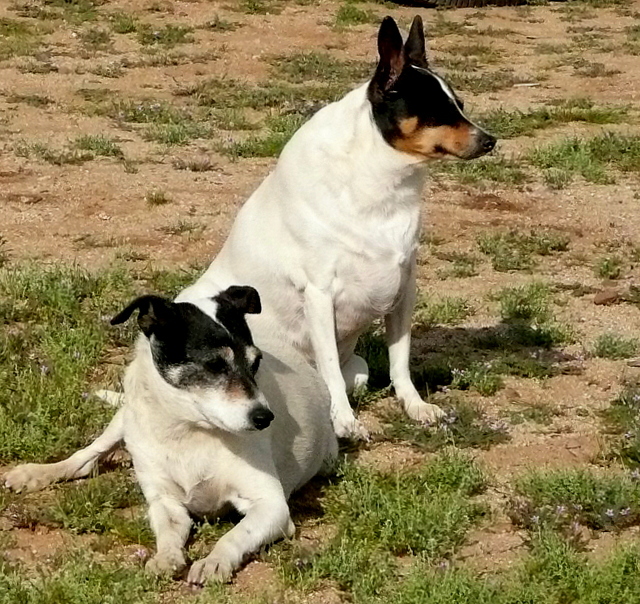 This entry was posted in Simple living and tagged Arizona, birds, boondocking, camping, cattle, desert, finches, rat terriers, snakes, Southwest. Bookmark the permalink. The heifers? Not so much. I’ve always wanted to ask you about Rattlesnakes. They scare me to death with dogs. In Southern IN they are getting so bad. One summer 2 yrs ago we were camping at Brown County State Park, and a family was walking a trail and their little dachshund came upon a rattlesnake and it bit the dog in the face. It died before they could get it to the vet. And we were in the park and on the same trail the weekend before them. Was so upsetting. I’m glad you have a lot of open area so you can see, that way, you, Spike and Bridget are safe. How horrible for that dog and its owners! Yes, I was studying the heifer faces! You had me totally wrapped in your words! Maybe Spike and Bridget should write a book!? Spike and Bridget on kindle! Oh a book! That would be a best seller! I would certainly buy one. Me Too and the boys would want an autographed copy!!!! Hahaha… I love those dogs. Spike on Patrol!!!! I wondered how he was managing those cows. They will likely be happy to see him move on, they can have their favorite tree back. As I work on setting up my Blog again, I think about this new dog we call Rowdy. He’s a schnauzer but believes he’s a German Shepard at times. I am planning to have his manhood modified before hitting the trails because last time, he ran off four city blocks in an unfamiliar city. It was not an easy apprehension. Thank you so much RVSue, Spike and Bridget for sharing your wonderful life with us. Hi Kay… Well, ol’ Spike has his “manhood modified” and he’s still a wanderer. The only thing that’s reining him in is the onset of old age. BTW, Rowdy is a great name! Beautiful desert pictures as always, Spike and Bridget are very photogenic and the desert looks so fresh now. 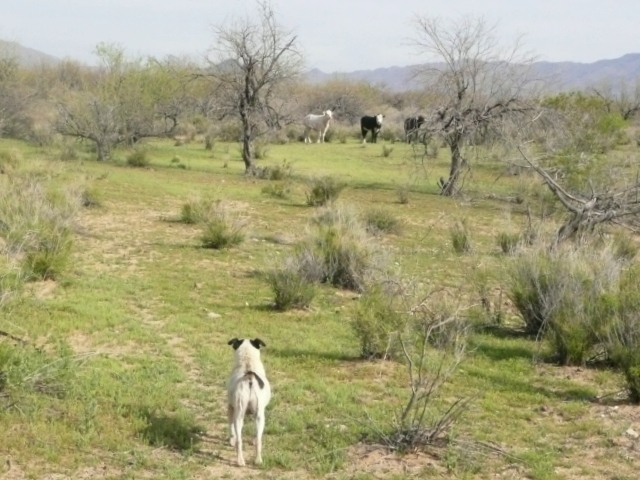 I can’t beleive how healthy the cattle look just grazing in the desert. I know you like to see them from a distance because of there habits of messing up your space lol. One of the biggest surprises I’ve experienced since hitting the road is how much greenery there is in the desert, especially grass. The cattle have a lot of forage here. 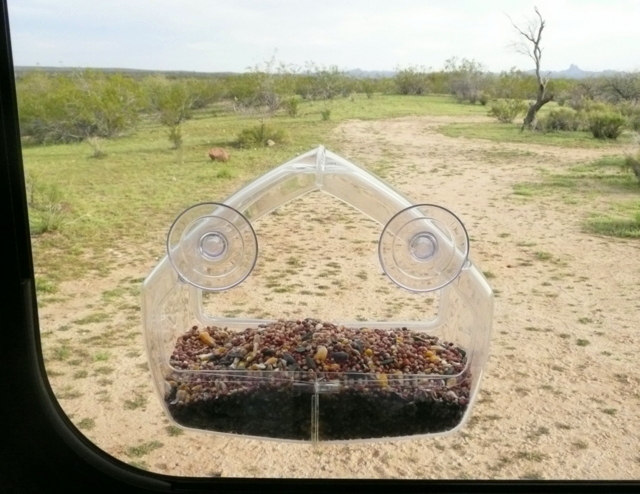 I love your idea of having a birdfeeder on your window! I hope that Spike relaxes with it so you get a little more action. But if he doesn’t, I found this little gem while wandering through Pinterest … Maybe you could do something like this to the one you have. I hope you don’t mind… I removed the link as it competes with Amazon which is against the Operating Agreement . It’s a great idea and I’m going to see if I can find it on Amazon. Oops … my bad. Well, I hope it didn’t mess anything up with your agreement with Amazon. One can usually find the same thing (or something very similar) there. Hi Rusty… Interesting… I’ll look for it at the next Wal-Mart. It sounds like a good thing to have on hand. Since your blog I check my email, offen. I love the crew. I’m looking for a mail service when I get on the road, may I ask which one you use? I use America’s Mailbox in South Dakota. I think maybe a mountain patch-nosed snake…maybe. They hang around mostly in Santa Cruz County, I think. Changes my mind. Desert Striped whip snake. I’ve used my walking stick (which is metal) to stomp the ground as we go. I never thought of bells. Two words, Bear Bell. I actually have one and I think it’s in my camping equipment. They are supposed to be for when you are hiking in bear country to alert bears of your presence so they won’t be surprised and thus put into attack mode. Never thought about using it as a snake deterrent but might just work. That snake is just a Garter Snake and friendly. They don’t even bite when you pick them up. It is good to see one and this fella is long and looks hungry as he is so slim and trim. Those range cows are still wearing their prison numbers. They look bad to the bone, but are just waiting for you to feed them I’ll betcha. They arn’t foreign invaders so some water and a bale of hay may be in order here. If they could knock on your door and ask, would you feed and water them? Aw, Joe… It’s always a tie with you and me. ..
come back until another day! every spring about this time of year…. It’s interesting how once in a while two different species will bond when they’re enemies otherwise. Aren’t the quail delightful? I’d love to attract them to our campsite but I fear they would bring in the coyotes. Wow! 30 years of RVing! Now we know where all the groves and wash board came from tee hee hee. every day except Sunday when I take a day off! with our guests! I play an AWESOME Arranger Keyboard! Hi Betty… Another camper moved into the area so now the heifers have another campsite to nose around in! Love Spike patrolling the camp…hope Spike doesn’t run into snake! I was ahead of a friend while hiking in Montana and out of the corner of my eye I saw something leap out from the tall grass, I screamed & leaped up and could hear a big thud behind me. My friend, John, nailed the snake on the head with his treking pole as the snake landed behind me. John swears he saw the rattle snake strike me so we look up and down my leg, even took off my shoes, but no bite marks…must’ve got my hiking boots instead. Every where we hiked in Montana, we ran into big rattlesnakes…they must have a lot of mice cuz the snakes were so fat! Now I hike w/bells on my treking pole…a little annoying but safer cuz the snakes rattle before I get too near. Dogs are funny. If you look at them, you can almost tell what they’re thinking by their actions and/or expression. The pics of Spike and Bridget says so much without words LOL! Well, now I know not to hike in Montana. Sheesh. Hooray for hiking boots. Interesting, I have hiked a lot in Montana including in areas with lots of rocks (I’m a rockhound after all) but hadn’t seen a rattlesnake until I went to Lime Creek area in Idaho. Now I have to look out for leaping snakes until I find that bear bell I have. You’re helping the wife and I keep our eye on the prize while we do our final year in the working for money rat race. We both really enjoy your blog. 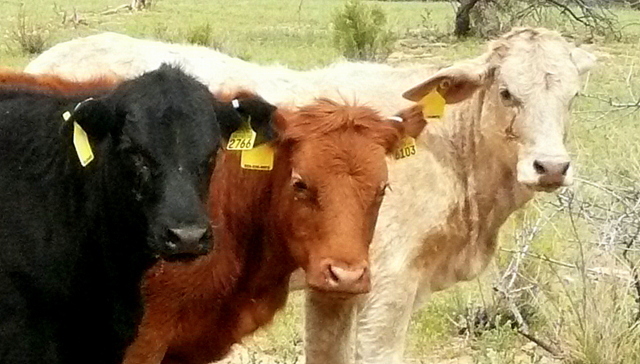 The heifers you are referring to are more than likely steers (neutered bulls). They have a right to be upset as aside from the obvious their lot in life is the get fat and be steaks and hamburger meat. Not that I have a problem with that as I think meat was put here to be a companion to the mashed potatoes on my plate. As for rattlers they are not that big a deal. They are hard to find even when you are looking for them and I have hunted them in my younger days. They are a bigger problems for the crew than you. It’s probably time to leash them on walks in rattler country. This time of the year rattlers are out sunning and city dogs just don’t know when to quit harassing them. As it gets warmer be extra careful outside at night. They almost always hunt at night. Again a great blog and we both look forward to reading it. PS I have used your portal to Amazon to order from them. I’ve answered your comment already. My computer is acting up this morning and dropped it. I’ll try again! Thanks for all the good information. As for the rattlers out at night, that’s why we stay inside. I don’t even want to sit around a campfire. The snakes may be away from the fire, but what about the walk to and from the BLT? Yikes… and like you say, the dogs aren’t as cautious. I’m a country girl and can tell the difference between a cow and a bull, even a neutered one. There are a few bulls in with this herd, probably to make sure there’s another herd next year. I’m glad my blog keeps your eyes on the “prize.” Retirement and RVing are a very big prize! Thank you for ordering Amazon products through my blog. I think people are beginning to forget about it. Maybe not forgetting about it just not writing a comment about every order they place. I read 4-5 other blogs that also offer a link to Amazon and yours is the only one that I have seen where people write comments to tell you that they have ordered something. I was doing the same thing, PlacesWeGo…. I was staring at those heifers trying to decide what their eyes and ears were saying. Then I laughed out loud at Susan’s remark about us looking at heifer photos. Honestly Susan, you know we are die hard fans!!! LOL. We now have a rescue dog (check your email). I wanted a companion for Sassy when she went outside. Charlie is a small dog, about a year old, a mix of some other small dogs, I guess. Our vet gave us a great deal of neutering and getting shots up to date. Believe me, it makes you feel good to “rescue” an animal and I am sure anyone can get a “deal” from a vet for doing so. Give my love to Spike and Bridget…and of course, a big hug to you. The number of dogs and cats killed on our behalf is a disgrace. When my home was a foster home for dogs, as soon as I had room (7 was my limit), I’d go down to the pound on Tuesday and pick out a dog from the many begging to be released. Wednesday was kill day at that “shelter.” Believe me, it was tough to have my students tell me excitedly, “Guess what? Our dog had 9 puppies last night!” All I could see were 9 faces down at the pound who had to make room for the new ones. Sorry to be so depressing. I’m thrilled that you saved one, Pauline! Every single one is precious. I understand why it’s not the right time. You can’t leave loved ones who need you. Always a pleasure to hear someone loves my blog. Best wishes to you, your husband, and Max. great post as usual! My neighbor bought me the same bird feeder last year. I was trying to attract hummingbirds. After several weeks no luck, she told me I needed more red visible to attract them. So I put 2 bouquets of plastic red flowers on either side of the feeder. Did not work. I took it down and my neighbor took it back and she put it up with results. I don’t think they liked the feeder being on a big glass surface, my front window. Good luck with yours, if you can keep the watchdog out of the window! You were trying to attract hummingbirds with a seed feeder? Sue, no it was for hummingbirds but the same style. used 2 suction cups to hold onto the window, and you filled it with sugar water. I didn’t have any luck with it, my neighbor did though. She had 3 large bird feeders that she put out to attract all kinds of birds to entertain her 3 cats. Thats probably why she had more luck with the hummingbirds too. For your next stop how about Cottonwood (near Sedona) in Prescott National Forest? Lots and lots of boondocking there in the forest. That’s where we’re headed next week. Should be perfect temps there right now. Most people stay around Thousand Trail Road, but there is lots of extra boondocking on other side of 260 on FS Road 360. Hi Nina! That’s the very map I’ve been studying for the last couple of days. I see lots of boondocking along those forest roads, but it’s hard to tell if they’re at the right elevation. I’ll check out your suggestion. I appreciate your help! I’m staying here to the limit because I love it. Good luck with the pups. I researched that several years ago before I bought the BLT. I don’t have the kind of discipline it takes to train these two. It’s probably a good idea. The crew is getting up in years, so I’m relying on caution. Thanks for mentioning it here. The heifers are adorable in their own way. I like Rusty’s idea about the extractor but only for YOU. A rattlesnake bite is 25x more dangerous for a dog than a person. The young ones don’t know how to disperse their venom and usually give you all it’s got. With that in mind…if one of the crew gets bit you don’t have the time to mess with the extractor. CARRY him/her to the PTV (walking will make it spread faster) and drive the PTV like you stole it. 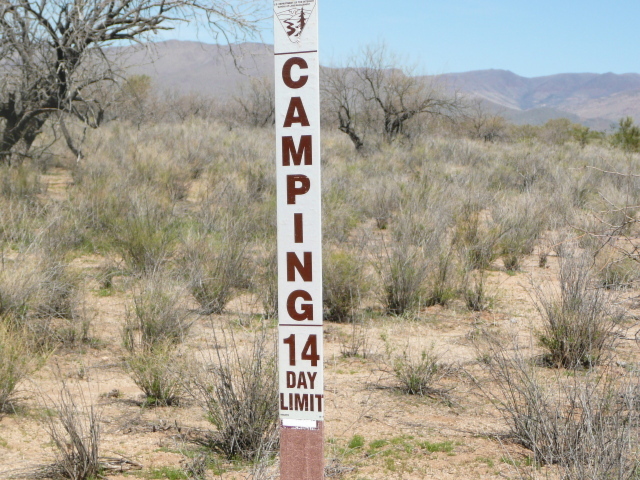 If it is rattlesnake season or country…ya might want to know where the nearest vet is for each boondocking site you camp at. Again no time to do a google search when the SHTF! Let’s hope you never have to be in that situation. I know you are careful with the crew. Teaching the crew “LEAVE IT” isn’t hard….just repetition. You can do it when you give em treats or pieces of rotisserrie chicken. Say “LEAVE IT” with tone…..don’t let it go. Once they release it or turn their heads away…then praise and reward them. SaraAnn had to pass obiedence school..the teacher threw her a hotdog…once it was IN here mouth..I had to say “LEAVE IT” and she dropped it. When we walk…if she starts smelling something…I’ll say “LEAVE IT” and she’ll walk away. It may seem like I’m being contrary . . . Spike is nearly deaf so “leave it” would, well, fall on deaf ears. As for Bridget, she’s so dang sensitive that if I said “leave it” as if I meant it, she’d be heartbroken. You could probably train them. I’d get frustrated and quit. Fortunately, they both have a tendency to run away from anything they aren’t sure is safe. Like when my inverter squawks or I get out the camera. Awww………poor Bridget…sensitve girl! You made me do a boo boo lip when I read that! Well good for them……I rather have them hesitant than too inquisitive. If those steaks are tough, I am blaming you, Miss Sue.